As of January, 2019, we have all of the traditional Shiftmate models back in stock, plus a few more. For years, people have wanted to mix Campagnolo and Shimano shifters, derailleurs and cassettes. For the most part, people want to use Campagnolo Ergo shifters, with Shimano rear derailleurs and Shimano cassettes. Campagnolo doesn't make rear derailleurs and cassettes that are particularly well suited to touring bikes and tandems. Yet many people with touring bikes and tandems also have racing bikes, and those racing bikes often have Campy's Ergo shifters. So naturally they want to have the same types of shifters on all of their bikes. But if you want a bike with Campy shifters, you've been out of luck, since Campagnolo no longer makes rear hubs to fit touring bikes and tandems. Enter the Shiftmate from Jtek. It makes various combinations of Campagnolo and Shimano drive train components compatible, by changing the rate of cable travel at the rear derailleur. So your Shimano rear derailleur will get the same amount of cable travel per "click" of a Campagnolo shifter as it would get from the appropriate Shimano shifter. 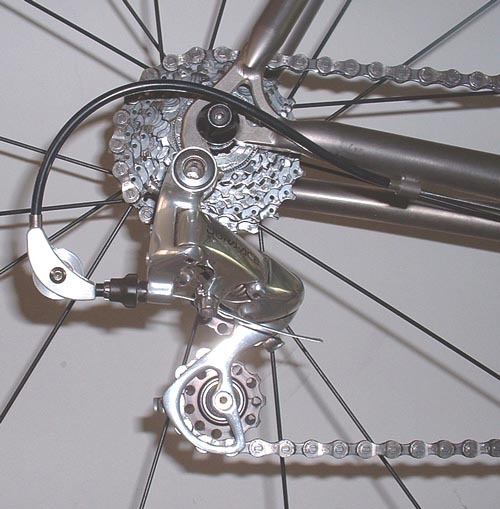 You can use any 9 speed Campy shifter, first version (pre-2001) or second (2001 or later), to shift any 9 speed Shimano derailleur on a Shimano cassette. Or you can use a Campy shifter and derailleur on a Shimano cassette. You can use Campy 10 speed shifters and Shimano cassettes with either Campy or Shimano rear derailleurs. Or you can do the reverse! See the table below for all of the combinations that work with the four versions of the Shiftmate. I've set up quite a few bikes using the Shiftmate. Most of them have had nine speed Shimano derailleur and cassette, and nine speed Campy Ergo shifters, using the Model 3 Shiftmate. The shifting has always been flawless. And, without exception, the only time that any customer has had difficulty using a Shiftmate is when he's reversed the alignment of the pulley, say, aligning it for Shimano shifter/Campy RD and cassette, when the bike has a Campy shifter and Shimano RD and cassette. In my opinion, the best use of the Shiftmate is for those who like Campy Ergo shifters, but don't like the limited gearing options and expense of Campy cassettes. Shimano drive trains tend to be a better value than Campy, but some people just love Ergo shifters. Also, Campy rear hubs have higher "dish" than Shimano, since Campy cassettes are wider than Shimano. This high dish makes for wheels that are less stable and more prone to breaking spokes. So, understandably the Model 3 is my biggest seller, by a significant margin. Model 1 is used when you have the same brand of shifter and rear derailleur, but a different brand of cassette. Also, the number of speeds must be the same for the shifter and the cassette. So, if the shifter is eight speed Shimano Ultegra, the cassette has to be eight speed Campagnolo. So, let's say you have a tandem with a Phil Wood 9 speed cassette hub and a 9 speed Shimano Ultegra 12-27 cassette. The tandem has Shimano 9 speed bar end shifters or STI shifters. You also have a racing bike with Campy Ergo shifters and you like the way they fit your hands better than STI. Also, you've heard from friends that STI front indexing doesn't work quite as well on a tandem as on a single. You want to use a Campy Ergo shifter with a Campy rear derailleur, and you want it to index perfectly with that Shimano cassette on the Phill Wood hub. The Model 1 will work for you. There are many combinations that work with the Model 1. They are all listed below. 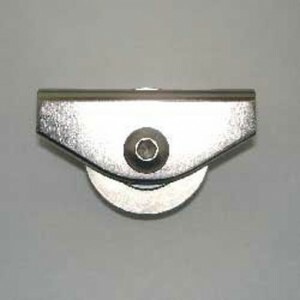 By changing the alignment of the pulley, you change the way the pulley alters the cable pull of the system. One alignment is for Campy shifters and derailleurs working with Shimano cassettes, the opposite alignment is for Shimano shifters and derailleurs working with Campagnolo cassettes. For Model 1, the number of gears in all components must be the same. So as long as all the parts are eight speed versions, you're all set. Same for 9 and 10 speed. Jtek has added three more Shiftmates, all having an "inline" design for newer mountain bike derailleurs. Which Shiftmate will let me use Campagnolo Synchro II shifters on my Raleigh 3 speed? We get lots of emails and phone calls asking if a Shiftmate might work with other components such as Mavic shifters and Huret Jubilee derailleur with an Atom five speed freewheel from 1971, or other such things. I have no idea if a particular Shiftmate will work with components other than those listed above. Sorry. Detailed installation instructions come with the ShiftMate. And if you have any questions or problems while setting it up, I'm just a phone call away. I can't remember which Shiftmate model works with which combination of components. I keep my brain on a strict "need to know" basis. So, if you email or call to ask if a particular Shiftmate works with some particular combination of stuff, all I'm going to do is open up this web page and read the descriptions. It's entirely possible that by using one of the Shiftmate models, you may get some odd combination of components to work well together, like Campy Syncro II shifters, a Simplex Super LJ derailleur, and a Suntour New Winner freewheel. But I don't know, and I have no time to test various combinations. The Shiftmate is not a good solution if you have some wheels with Campy cassettes and some with Shimano. It takes several minutes to install the Shiftmate, and the same to remove it. You really don't want to be swapping it on and off of your bike, unless you're a glutton for punishment, and have an unlimited cable budget. I recommend you put it on, and forget about it.